This isn’t actually from the batch of puer I’ve been going through. Someone gave it to me the other day. While it’s brewing, I definitely notice a coffee smell in with the puer. That’s good, I’ve wanted to try one of these. It actually had a few whole or nearly-whole coffee beans floating on the top when steeping. Despite having a pretty noticeable coffee aroma, there isn’t a whole lot to taste. 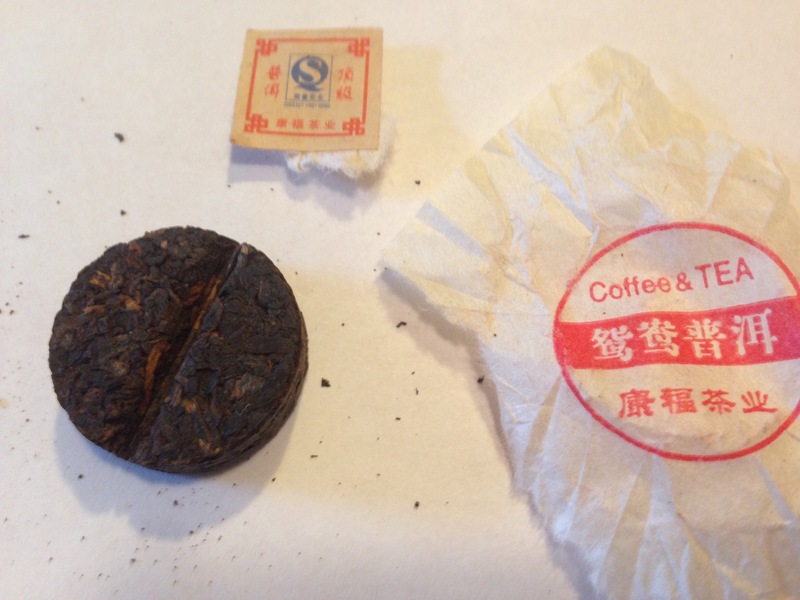 There’s a little bit there, but the puer dominates. 08 Apr	This entry was published on April 8, 2016 at 12:15 pm. It’s filed under Brewing, Coffee, Drink, Tea, Uncategorized and tagged andrew vochman, coffee, drink, food, introduction of heat, puer, tea. Bookmark the permalink. Follow any comments here with the RSS feed for this post.